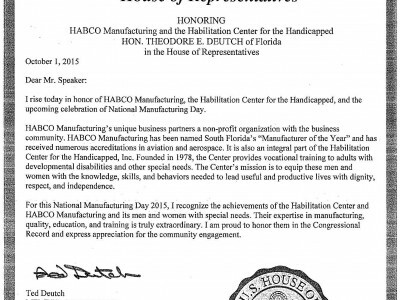 BOCA RATON, Fla. – HABCO Manufacturing will celebrate National Manufacturing Day by hosting a tour of its manufacturing facility, located at 22313 Boca Rio Road in Boca Raton, on Friday, October 2 from 1:30 p.m. to 2:30 p.m. 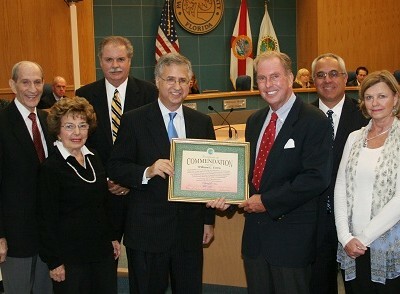 Visitors will have the opportunity to witness the organization’s unique business – a non-profit organization partnering with the business community – as well as meet Congressman Ted Deutch and Commissioner Steven Abrams. HABCO Manufacturing has been named South Florida’s “Manufacturer of the Year” and has received numerous accreditations including AS9100C (the next level after ISO9001) in aviation and aerospace. The organization’s award-winning manufacturing operation provides sophisticated turnkey logistics and supply management, engineering, quality and production. This unique program offers client training in the following areas of expertise, among others: Electronic and Mechanical Assembly; Cable Assembly & Wiring Harnesses; Cellular Phone Repair; Contract Packaging & Fulfillment; Product Testing; Repair, Recycling, Refurbishment; Kitting and Warehousing; and Sewing. The National Manufacturing Day event is open to local manufacturers and businesses who may be interested in learning about the Habilitation Center’s capabilities. Guests will tour the facility and learn about the organization’s state-of-the-art environment and special programs. HABCO Manufacturing is an integral part of the Habilitation Center for the Handicapped, Inc. which was founded in 1978 for the purpose of serving adults with developmental disabilities and other special needs. The Center’s mission is to equip these men and women with the knowledge, skills and behaviors needed to lead useful and productive lives with dignity, respect and independence. The Center counts heavily on its Manufacturing Services Program, which, in addition to being an excellent vocational training program, is also a dynamic enterprise and a vital source of operating revenue. For more information, visit www.habcomanufacturing.com and www.habcenter.org.